The Law of Jutland. Denmark c. 1490. Rostgaard 6 8º. Parchment, 135 fols. 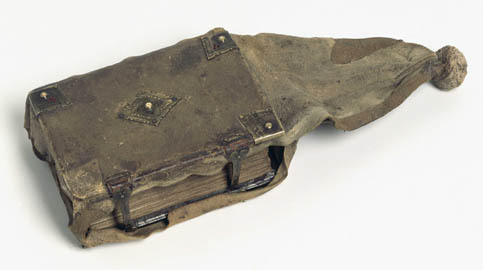 This is a so-called girdle book, a kind of binding that was in use in the 15th and 16th centuries and was well suited for carrying books. The book has an extended covering of soft leather that ends in a knot made in such a manner that the book can be hung from the girdle or belt and swung upward for reading while still attached to the girdle, or be hung from a saddle horn. This binding is from about 1540 whereas the manuscript itself is a little older. The manuscript can be traced back to the scribe Jens Nielsen. It contains legal manuscripts – the Law of Jutland i.a. – and it has probably been useful for judges and others who travelled to local outdoor things to bring their texts in a girdle book. The book: 13 x 9.6 cm. The binding is c. 30 cm long. References: Erik Petersen (ed. ), Living Words & Luminous Pictures. 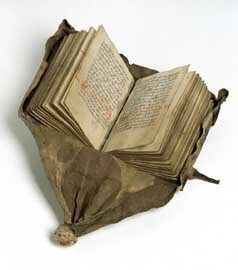 Medieval book culture in Denmark. Catalogue, Copenhagen: The Royal Library 1999, pp. 42-45 (Law books). Viggo Starcke, “Posebind og Posebøger”, Bogvennen, New Series, Vol. 4, 1949, pp. 60-89 (in Danish with English summary).